Do the floors in your home look out of fashion or drab? Ready to replace it with flooring that's resilient and easy to clean? The Floor Factory has the perfect type of flooring for you: ceramic tile! 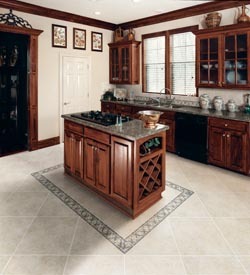 Wenatchee homeowners love our comprehensive selection of ceramic tile flooring. You'll be sure to find a product that will look beautiful in your home. Whether your decor is traditional or sleek and modern, you can rely on our friendly sales specialists to help you find something that's your style. Need a new backsplash or countertop in your kitchen or bathroom? Ceramic tile isn't just for flooring; it can also be used as a wall or counter covering. At The Floor Factory, we sell ceramic tiles in a wide variety of sizes and a rainbow of colors, including earth tones and bold, bright hues. In addition to having a wide array of flooring, we have a seasoned team of installation professionals at The Floor Factory. Our Wenatchee ceramic tile installation is affordable and ensures your brand-new flooring will last as long as possible. At The Floor Factory, we also offer comprehensive warranties to guarantee customer satisfaction. Are you interested in learning more about our ceramic wall tile products or have a question about our installation services or warranties? Call our shop now to speak with one of our flooring experts!